Not unlike contemporaries James Blake or José Gonzalez, Jed and Lucia seem to have perfected the art of crafting compelling songs based on a strong folk sensitivity but wrapped in electronically enhanced echoes and beats. Active since 2005, Jed and Lucia are actually Mark Reveley and Emma Lucia, a couple on- and off-stage. In their home studio, up in the hills of Berkeley, CA, the pair compose, write and produce all their music together, in a continuous process of mutual creative exchange. The result is a fascinating blend of dreamy, ethereal folktronica with vocal harmonies reminiscent of classic 1960s Cali-pop. 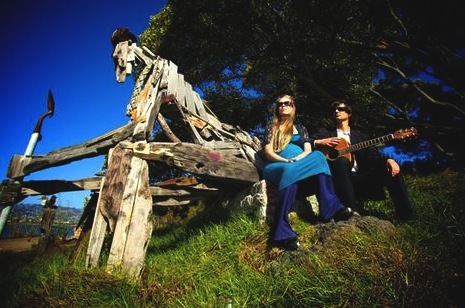 Their 2010 album Superhuman Heart is a kaleidoscope of tunes dreamed-up and recorded in and around their home. Jed and Lucia’s acoustic guitars and poignant lyrics are subverted by sun-drenched synths and bass lines that add a subtle dose of urban bump and grind. Folksy songs are transformed by acid-tripped atmospherics in a soundtrack for creatures that crawl from the back woods into the city at nightfall. If you like Jed and Lucia’s album, don’t forget to check out their previous release, Many Many EP, and their brand new Helium EP, recently released on Ubiquity Records. As a bonus, here’s the title track of the Many Many EP. Copyright © 2019 umstrum||music. All rights reserved.